Hiking alone around the Japanese mountains gives one plenty of opportunity for rumination and general navel-gazing. I guess in a way that’s part of the attraction – getting away from the normal hubbub and allowing the mind some space to step back and take stock. Yesterday I had a very agreeable few hours exploring the hills above Hatonosu in the Tama valley. We’ve been spending a lot of time around here recently, in particular around Lake Okutama. Big M is not a fan of Yamanobori (mountain climbing) – hence the reason that I tend to hike alone. But she does enjoy being outside. 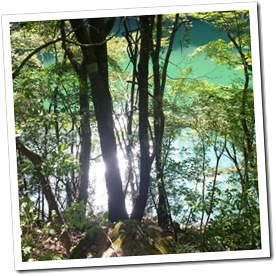 Lake Okutama boasts a well maintained, and most importantly, an almost entirely flat hiking trail along its southern shoreline. We’ve had a couple of nice days exploring the 12km trail, enjoying the views and catching rare glimpses of the forest’s residents, such as monkeys and snakes. In Old Norse tradition, the world was supported by Yggdrasill, the World Tree connecting the nine worlds of Norse mythology. Its roots ran to the wells of knowledge, while its upper branches reached to the heavens. The world of men lay nestled in its branches and squirrels ran up and down the trunk carrying messages between the gods and the different worlds. The evergreen tree as a symbol of life is deeply embedded in Western European culture; it’s why every English churchyard sports a yew tree, and why we celebrate Christmas with a decorated pine tree – a distant echo of a far older pre-Christian tradition. I was pondering yesterday, how the Norse view of the universe as being supported on the limbs of a great tree could be interpreted another way. If one were to imagine one’s existence not as a 3 dimensional creature, but as a 4 dimensional one – the extra dimension being time – the effect rendered back into 3 dimensions would not be unlike looking at a tree. Every branch would represent some decision point in your life, where reality takes a fork into two equally valid but increasingly divergent realities; each then forking again and again as they extend upwards before finally tapering to a singular conclusion as they touch the sky. The thing about trees is that they grow upwards towards the light. A tree never juts out a limb sideways unless in an attempt to find a new way towards the light. Unconsciously, the tree knows how to do this, and I guess we do too – constantly searching for meaning and fulfilment in life. Perhaps we too know that when we lose our thirst for sunlight, we will wither and die. But most of the time, as long as we keep trying to move upwards, just like the tree reaching upwards, our efforts will prove successful no matter what branch we start from. There are no wrong turns because we can always go forwards, and upwards. We just need to chose to. Carrying on with my tree-related ponderings, I thought about the different trees and how the environment shapes and changes them, just as our environment shapes and changes our own development. The English Oak stands solidly alone. Its massive roots reaching deep into the earth to support its sturdy trunk and spreading foliage; the Japanese cedar grows tall and strong in the company of its fellows, wasting no effort in reaching straight for the sky from the dark forest floor. Like the roots and trunk of Yggdrasill, I kind of see each of us supported by our personal histories, our cultures and our families. The deeper and stronger these roots, the stronger we are and the higher we can reach. I guess that’s why these things are so important to me – to us as human beings. And how important it is to recognise that everything we do now, everything we are, is rooted in our past effort and the efforts of those who have gone before. Our parents, our families, our ancestors and our communities How much we have to be thankful for. So why not do something right now to nurture your own root stock – hug the mrs; pick up some litter from the street outside your house; phone your mum; take the time to appreciate the good things about where you live, who you are and where you’ve come from. See if you can’t grow an extra inch upwards today!